Zerg’s main building, the hatchery is also its main production building. Units (except for the Queen) are morphed from Larva. The hatchery is the only building that produces larvae. Some units morph from other units. The hatchery automatically generates larvae at a slow pace. You can speed up larva production by building a queen from the hatchery and using its Spawn Larvae ability on a hatchery. Some units are locked and require specific buildings. In order to unlock a unit, the corresponding building must be built. Some buildings are locked behind tech tiers. Making buildings consumes the drone that is used to construct it. With the exception of the hatchery and extractors, buildings can only be built on creep. Creep can be extended through the use of creep tumors laid down by queens. Zerg supply is not built. They are spawned units called overlords. Overlords are also used for scouting and spotting enemy movement. In order to understand how Zerg works, here’s a very basic, aggressive opener. If you’re completely new to build orders, I’ve written a guide on how to read them (link) but for now, all you need to know is that the 14 before every line corresponds to supply. In Legacy of the Void, you start with 12 supply so to get to 14, you build 2 Drones. 14 – Overlord. @100% Overlord, build 2 more drones. @100 Gas, research Metabolic boost from the Spawning Pool. Remove drones from Extractor and put them back on minerals. Once the queen spawns, have her inject immediately. From here on out, start producing zerglings and only zerglings. Build Overlords if necessary and keep injecting with the queen. Once Metabolic Boost is finished, proceed to attack your opponent. While attacking, keep building zerglings, injecting, and building Overlords. The Zerg is the most unique race of Starcraft 2. All units are produced from another unit called the larva. Larvae can only be found near hatcheries and no other building can produce larva. Larva is automatically spawned at a regular but slow pace. In order to improve the rate of larva generation, another unit called the Queen needs to use its Spawn Larvae ability on the hatchery. Spawn Larvae is an incredibly important spell since it is the only way a Zerg can keep up with the production of the other two races. If a Zerg only relies on the natural larva spawn rate of the hatchery, he will find himself quickly overrun. Drones are used to build Zerg buildings. When a drone morphs into a building, it consumes the drone. 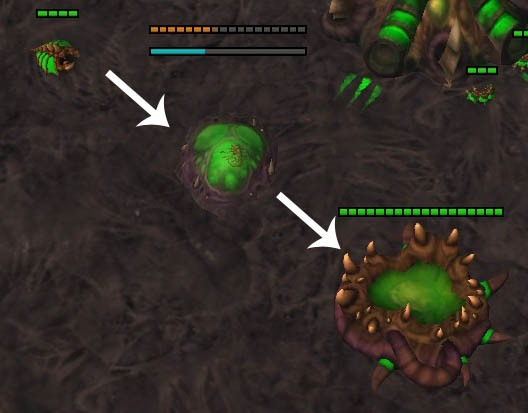 Zerg buildings are used to unlock the ability to morph specific units from larva. While most units are produced from larvae, you cannot build a unit unless you have built the building that unlocks it. Buildings are split into three tiers. Tier 1 is the Hatchery tech. This includes the Spawning Pool and the Roach Warren. Most of the core Zerg units are unlocked at Tier 2, Lair tech. Lairs are morphed from hatcheries and requires a spawning pool to be built. You only need 1 lair to unlock Lair tech buildings but you are able to morph multiple hatcheries into lairs if you want. Similarly, the late game units are unlocked at Tier 3, Hive tech. Hives are morphed from lairs and requires you to have an Infestation Pit. With the exception of the hatchery, all Zerg buildings can only be built on creep. If a building somehow loses its contact with creep, it will slowly lose health until it dies. Creep is produced from all three hatchery types, from Overlords using the Generate Creep ability, and from Queens using the Creep Tumor ability. Creep Tumors themselves have the ability to spawn another creep tumor. Zerg supply does not come from a building but a unit called the Overlord. Like most Zerg units, the Overlord is spawned from larva. The Overlord moves at a very slow speed and cannot attack. The Overlord has the ability to morph into two distinct forms. One is the Overseer, a scouting unit, and the other is a Transport Overlord which can transport up to 8 supply of units. Overlords can be used for spotting as well. Positioning Overlords in key places can spot incoming enemy attacks. In order to make the most out of Zerg, you need to master 2 basic mechanics: injecting and spreading creep. 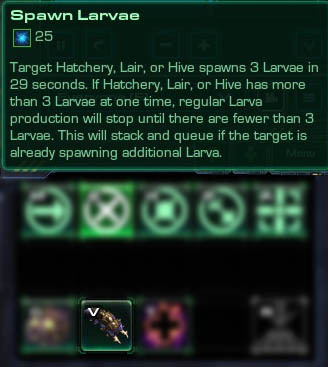 As it is the only way for Zerg to produce units, Larva’s importance cannot be understated. In order to produce more units, you must have access to a lot of larva. However, the speed in which a hatchery generates a larva on its own is not enough to keep up with the production of the other two races. This is why the Spawn Larvae ability (colloquially injects) is the most important ability a beginner Zerg player should know. When injecting, a timer appears above a hatchery. When this timer runs out, 3 additional larvae is generated. These larvae are independent from the automatically generated larvae the hatchery produces. There can only be one inject running per hatchery at a time. However, a Queen can queue multiple injects that start as soon as the current inject finishes if she has the energy for it. It’s not uncommon to see a queen produced for every hatchery a Zerg has. This Queen is often delegated to specifically inject larva and rarely leaves the hatchery so that it can inject as often as she could. In order to speed up injecting, you need to have a way to cycle through all your bases quickly. You can either use Location Hotkeys or use the Base Cycle hotkey. Having all queens in one hotkey can also help. Zerg benefits for spreading his creep throughout the map. Firstly, creep provides a passive speed buff to all Zerg units that walk on it. The Queen herself moves very slowly when not on creep. This speed buff may not seem much for a beginner but battles can be decided on whether the engagement happens on creep or not. Creep tumors also provide map vision. Creep in all entrances and flanks will enable a Zerg to respond quickly to incoming attacks. There are multiple ways to spread creep but the most used one is through the Queen’s Creep Tumor ability. Zergs often use a queen or two dedicated to spreading creep. Multiple creep tumors at a location will allow the creep to spread at a faster rate. Each individual tumor has the ability to spread another creep tumor on its own, further allowing the Zerg to push his creep spread. A creep tumor creating another creep tumor. If you noticed, most of the Zerg mechanics revolve around Queens. While not a very strong combat unit, Queens are the backbone of the Zerg army. Remember to build one Queen per hatchery dedicated to injecting with 1 or 2 queens roaming around with the sole purpose of spreading creep. Because of the ability to produce a lot of units at once, Zerg units are generally less cost efficient than the other two races. Zerg’s strengths are in numbers which is why it is important that a beginner Zerg to have a grasp on the larva mechanics. On a positive note, Zerg has the ability to reinforce the fastest due to larva mechanics as well. The most efficient way to produce units is to assign all hatcheries (including lairs and hives) to a single hotkey. When you hit the assigned hotkey and press the “Select Larvae” command, all available larvae across all hatcheries you have hotkeyed will be selected. From then on it’s only a matter of tapping the corresponding hotkey of the unit you choose. For example I have my hatcheries hotkeyed at 5. In order to produce a bunch of Zerglings quickly, I hit 5, hit S (the “Select Larvae” hotkey), then hold down Z button to convert all my available larva into Zerglings. Morphing is a big theme of the Zerg. Some units are not produced from larva and instead are produced by morphing existing units. Some of these morphed units also require a separate building of their own to unlock. Others even require you to morph the building it needs from another existing building! You don’t lose the ability to produce the prior available units when you morph a building so you don’t generally need two different ones. Unit upgrades are separated into Melee and Ranged and a combined one for Armor. There are three levels of upgrades, one for each hatchery tier. You need to unlock the corresponding tier in order to upgrade further. Due to the weak nature of Zerg’s individual units, keeping up with upgrades is a must. Evolution chambers should always be researching upgrades. If you can afford it, do not be afraid to build two Evolution Chambers to upgrade attack and armor at the same time. Due to how the Zerg upgrades are separated (melee and ranged), most Zerg unit compositions are either melee-oriented and ranged-oriented. You can discover which composition will work for yourselves. Experimentation is half the fun! As a guide, here are a few common unit compositions. The premiere ranged unit composition of Zerg. This composition is very beginner friendly as there is less micro involved. The added durability of roaches, especially compared to Zerglings means that you’re less likely to lose your army to strong AoE attacks. This unit composition starts off as pure roach. Once you are comfortably mining on two bases, adding on ravagers will greatly increase the versatility of the unit composition. During this phase, Roach-Ravagers can deal with most early-game unit compositions from other races. They are weaker against mass Marine-Marauder compositions due to the lack of splash and against air compositions due to the lack of a dedicated anti-air (although the Corrosive Bile ability can hit air if you can land it). I find Roach-Ravager compositions very effective against Liberator harassment, especially if you can catch them mid-transformation before they set up. It takes 3 Corrosive Bile shots to kill a Liberator. As you go into the mid-game and start to take additional bases and more importantly, additional gas income, adding on Hydralisks and eventually Lurkers will greatly improve the strength of this composition. This unit composition relies on heavily upgraded Zerglings and rushing into Tier 3 to produce Ultralisks. This composition is larvae-heavy and is a great way to practice injecting. When doing a mass Zergling style, do not be afraid to build additional hatcheries, even away from mineral lines. These hatcheries will serve no other purpose as to produce larvae. Remember to produce a Queen to inject larva to this hatchery too! This composition is significantly more difficult than the Roach-Ravager composition. 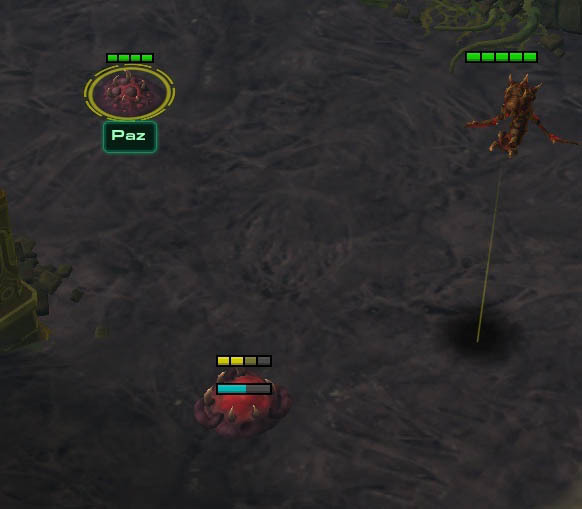 In order to make the most out of Zerglings, you need to learn how to surround and flank. It’s also very vulnerable to mid-game attacks, so be careful. The key to this composition is constantly upgrading melee attack and armor. If you can’t make it into Ultralisks in time, Lurkers would do well to supplement the mass Zerglings. Also called LBM (Ling-Bane-Muta), this was the go-to build for Zerg versus Terran before the Liberators arrived in the scene. Due to the gas cost of Mutalisks, it cannot be efficiently paired with anything except Zerglings and Banelings. Not that it’s a bad thing as both units are extremely mobile. This unit composition works best using hit-and-run tactics as it is not very strong in a straight up fight. If it comes down to it, however, the addition of Banelings to deal splash damage can edge out a victory. Apollo’s Tutorials – Old one, but still worth it if you really need to know the basics. Team Liquid’s Zerg Help Me Thread – Where you go if you have questions. A bit strict but follow the rules and you’ll be fine. Hi, it’s nice to see another Starcraft blogger. Cheers. Hey, your blog is one of my biggest inspirations! Thanks!